The additive manufacturing revolution is in full stride, flying in aircraft and giving manufacturers a robust tool for design and production. Burintekh added Delcam’s FeatureCAM feature-based CAM system to help the company cope with the ever-increasing complexity of its customers’ designs and the constant pressure for faster delivery. Fanuc America Corporation is expanding the availability of its arbitrary speed threading function, making it available for the 0i-TD and 0i Mate-TD CNCs it supplies for new turning machines. The function was previously introduced for the Fanuc Series 30i-B and 30i-A CNCs. In a Chinese factory, Ford Motor Company and its partner Changan are on a quest to meet the demands of a new consumer with innovative automation from ABB Robotics. As large composite structures become mainstays of aerospace design, part fabricators are turning to innovative machining systems to fine-tune the dimensions of these parts for assembly. In a few years, could we just have one functional safety standard? The world has two predominantly accepted functional safety standards for machinery: IEC 62061, Safety of machinery: Functional safety of electrical, electronic and programmable electronic control systems, and ISO 13849-1, Safety of machinery - Safety-related parts of control systems - Part 1: General principles for design. MME group was founded in 1974 as a tool and die shop in St. Paul, Minn. Twenty years later, and before taking on production molding, the company discovered that short leadtimes for new tooling was a key component of the entire new product development process. A German mould shop has earned a name for itself through the precision and quality of its work. The shop recently upgraded its EDM unit, a move that boosted exactness and reduced processing times. A technology being marketed as “something completely new and different in metal forming” is attracting attention in North America, as it has in Europe. 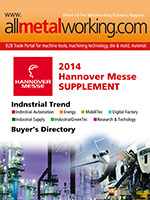 Update your allmetalworking products information to keep ahead with market trend.